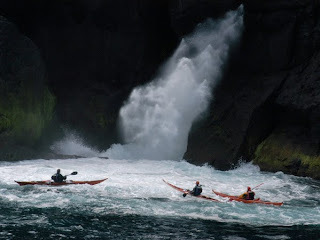 October 2006 saw nearly a hundred kayakers come together for the 1st UK Storm Gathering on the Island of Mull. Organised by yours truly with the support of many great guest coaches, it provided a memorable opportunity for paddlers from all over the UK, Europe and the USA to come together and share their experiences and skills. Building on this success Stornoway Canoe Club are hosting the second event on the Isle of Lewis from 18-20 October 2007. With its world-class sea kayaking, the Isle of Lewis is the ideal location to host the 2nd Storm Gathering. The islands have a longstanding and rich relationship with the sea and provide the chance to combine the adventures of sea kayaking with a cultural celebration. Appropriately the hub for the event will be based in Stornoway’s new Arts Centre, An Lanntair. The Storm Gathering will run from 18 to 20 October 2007 and a total of sixty places are available for kayaking participants at a cost of £95 each. This fee includes all formal events of the gathering, including guided kayaking sessions, evening presentations and the ceilidh.